Want to increase traffic to your website? Looking to expose your business to new customers? Want to add an extra dimension to your media campaign? Then promote your business on Tool Cobber! Tool Cobber gives you the opportunity to advertise directly with the publisher of your ads, delivering you the result you want at a much cheaper rate. have a PayPal account already simply click here to set one up - it only takes a few minutes, and best of all it's free! 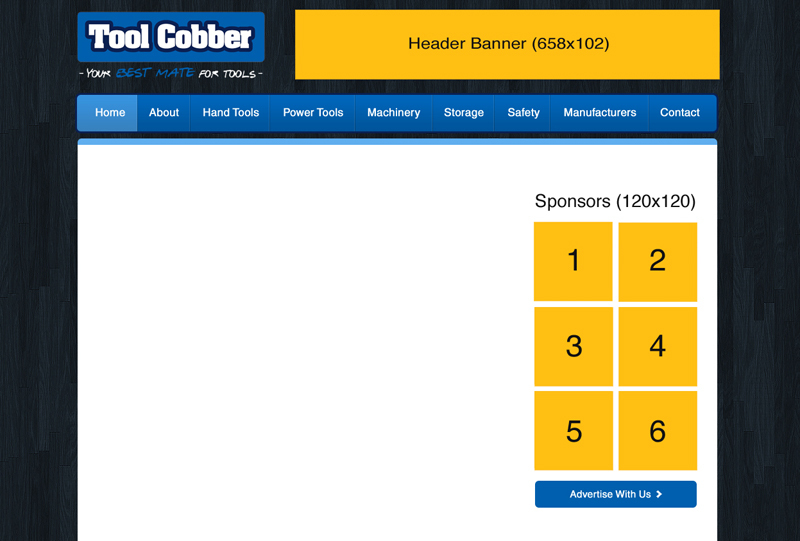 If you would like to advertise with Tool Cobber, simply complete the form below, follow the links, and authorise payment through PayPal. Upon receiving confirmation of payment, your banner will be uploaded to the site in the specified position for the purchased duration (a minimum of 10 days). Alternatively, please make contact here to organise your FREE TRIAL! Please note that fields below marked with an asterisk (*) are mandatory, and that terms and conditions do apply (see link below). Period of days at a total cost of $ AUD. 2. The reproduction and/or publication by the Publisher of the Banner (including but not limited to any photographs contained in the Banner) and/or of any Materials supplied by the Advertiser within the Banner and/or the use by the Publisher of the Advertiser's logo and trade marks in the Banner will not breach any contract; infringe any third party Intellectual Property Rights or other rights; render the Publisher liable to any proceedings whatsoever; and/or harm or detriment the reputation of the Publisher and/or of any other companies. 5. Website administration may at any time remove any or all of the Banners and /or other of the Advertiser's materials from website, which in the Publisher's opinion are unlawful or have been placed on the website in breach of this Agreement or in the event of non-payment or any other breach of the Agreement. 8. The Advertiser shall report to the Publisher any suspected faults to the Service as soon as the suspected faults come to the Advertiser's attention. By clicking the "Continue" button below you agree to the Terms & Conditions of this transaction.